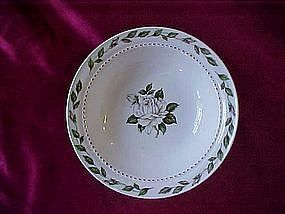 Hall Superiors 5 1/4" rim sauce/dessert bowl in the Cameo Rose pattern. Large single white rose center with rosevine and buds on rim. Gold dots on inner rim. See photo for the backstamp which states Tested and approved by Mary Dunbar, Jewel Homemakers Institute.Perfect condition. Price is for one. I actually have 10 availiable, so if you want more please let me know. 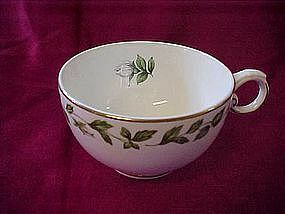 Cameo rose footed cups by Superior Hall Quality Dinnerware Tested and approved by Mary Dunbar Jewel Homemakers Institute. White rosebud inside cup and rosevine and white rosebudborder on outside of cup rim. Gold trim. I have other pieces to the set also listed. These are in perfect condition. There are 6 available. Price is for each cup, let me know quanity when ordering. 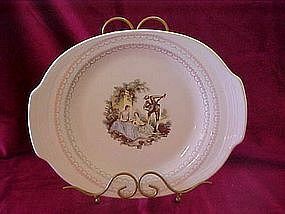 This is a nice 14" oval platter in the Serenade pattern by American Limoges Sheffield USA. Central design of a victorian trio, and he serenades the ladies. The platter is in very nice condition, with no chips, cracks or repairs. See photo. I have a few more pieces in this pattern if interested. 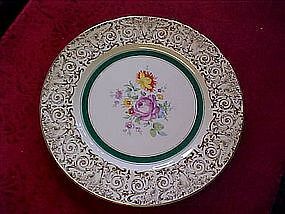 This is the 6 3/8" bread plate in the Serenade pattern by American Limoges, Sheffield Usa. Very good condition with no chips cracks or damages. Price is for each, but I do have 5 available.Let me know quanity. I have other pieces to this set also, ask. 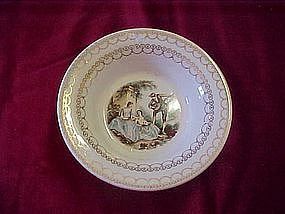 This is a 6" saucer in the serenade pattern by American Limoges, Sheffield, USA. Very good condition, with no chips, cracks or damages. Price is for one. But, I do have 3 available. I have other pieces of this set also, just ask. 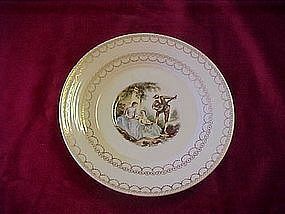 This is a 6 3/8" bread & butter plate in the Serenade pattern by American Limoges, Sheffield USA. Very good condition, with no damages. I actually have 3 of these available. Price is for each. I also have other pieces in this pattern, just ask. This appears to beFrench Saxon, the back stamp says Made in Usa on the cup bottom, but says Ovenproof Dinnerware Handpainted on the matching larger pieces. Backstamp is an artists pallete. (See photos) I have 5 of the cups available. All in perfect condition other than a bit of crazing. Price is for each. Other pieces also, check out my site. 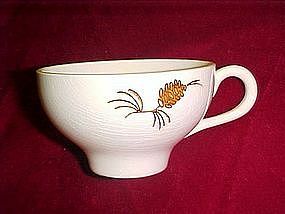 These are 6" saucers to the dinnerware set with a handpainted pinecone pattern. Appears to be Stetson. The stamp says Handpainted, Ovenproof (see photo) Great condition other than some crazing on some. I have 12 of these. Price is for each. Other pieces to the set available, see my website. 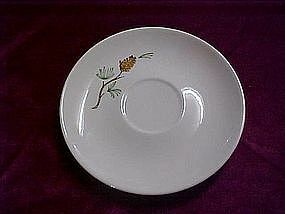 Wonderful pinecone pattern dinner plates measuring 9 3/4". Appears to be Stetson. 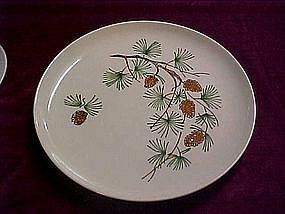 Backstamp of artists pallate with Ovenproof dinnerware, Hand painted, Made in USA. (see photo) Great shape, There is crazing under the glaze. I have only 1 of these available right now, but have other pieces to the set. Price is per piece. 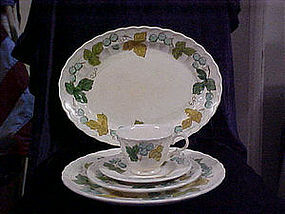 Three tier server in the eggshell cavalier pattern by Homer Laughlin. Not Marked. Pretty turquoise aqua band on white with Gold crown trim. 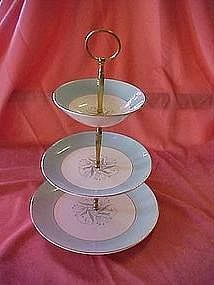 Three tiers high with largest plate measuring 9 1/4" wide. Top tier is actually a small bowl. Put together with metal gold color plated dividing pieces with a carrying ring at the top. Over all height is 14". No chips, cracks, crazing, or damages of any sort. Great accessory for this set. This is one of Hall chinas, cadet blue shakers with the royal rose pattern on the handle. The shaker measures 4 1/2" tall,is in perfect condition and even has the original cork. The holes form an S, for salt. Look closely at the pattern on the handle. I have two of these salt shakers for sale and the rose is slightly different on each. Make sure you purchase the right one for your needs, and give the correct item # when ordering. This is Hall Chinas cadet blue salt shaker in the royal rose pattern. It measures 4 1/2" tall and has the pattern on the handle. Perfect condition , even has original cork. Holes in top form an S, for salt. 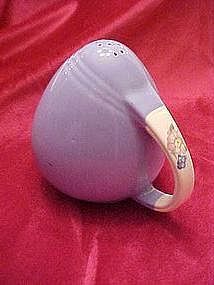 Please view photo #2 to see actual floral on handle as it varies from the original catalog photo slightly, and I have another shaker offered that is similar. Be sure to give this item # when ordering to assure you get the shaker that matches your needs. 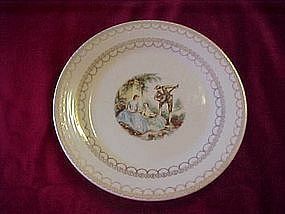 Wonderful large dinner plates by Edwin M. Knolwes China Co. Dated 1942. Floral center with a green band and gold chantilly filigree border. Measures 10 7/8" in diameter. I have 6 of these available, and all are in fantastic condition with no chips or cracks. Price is for each plate. These would make great plates for wall decoration also, since they are so large and flat. Nice set of old budouir size lamps. Pink with white bows, very cute. Looks like it may be made by Hall China. Nice and heavy. Lamps measure 11 3/4" to the top of the socket. No shades. These lamps would use the shades that clamp directly on the bulb. Both are in perfect condition. 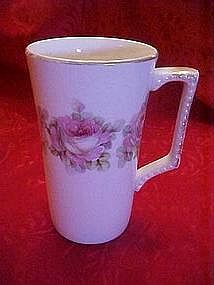 Wonderful old china cup measures 4 5/8" tall and has a lovely center band decoration of large pink roses. Gold trim on the handles and rim.The handles have a bump relief. Gold is slightly worn on the top rim. I have 2 of these cups, and both are in perfect condition. Price is for each cup. 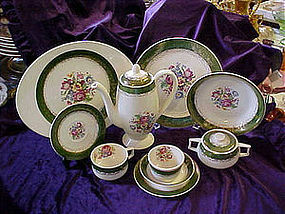 Marked Dresden China on the bottom . 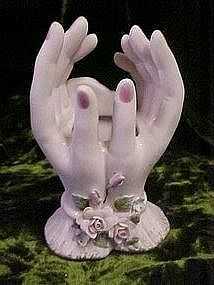 Lovely Lefton hands vase. 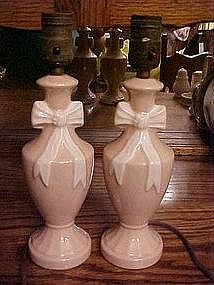 Made of pale pink bisque porcelain. Measures 5 1/4" tall. Has marking which was used in 1949-64 and the foil sticker and the # 1790. It has pretty applied porcelain roses at the bottom. Fantastic condition. It looks like one of the lower rose petals could be chipped, but not sure, you judge. It is a lovely vase.